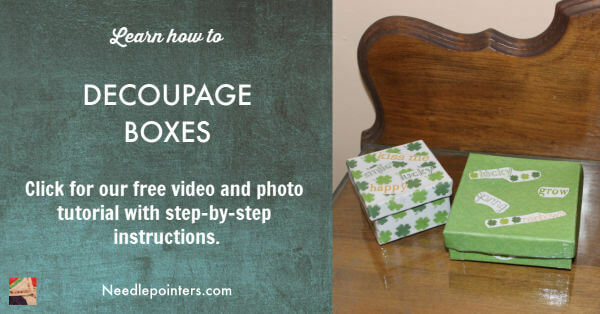 Learn how to decorate a plain box with decoupage and scrapbook paper with our video and photo tutorial. This tutorial will give you step-by-step instructions. 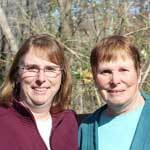 Look below for links to supplies for this project. 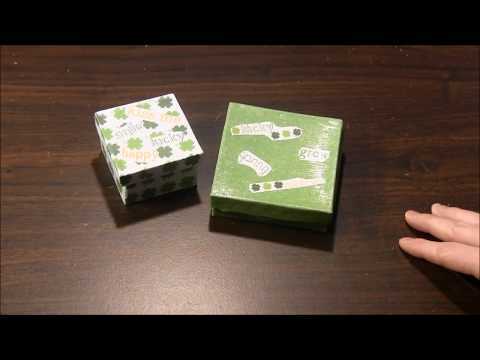 Watch this video tutorial and read on to see how to make this decoupage box. 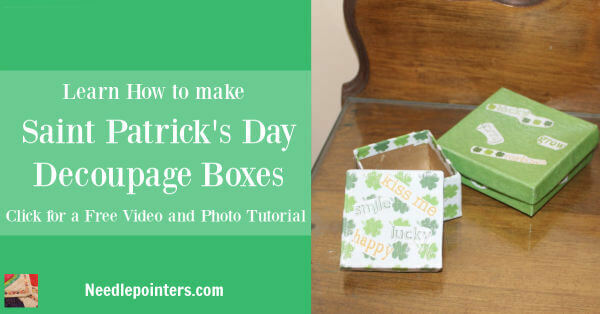 Click to watch the Learn how to Decoupage a Box using Scrapbooking Paper video in Youtube. 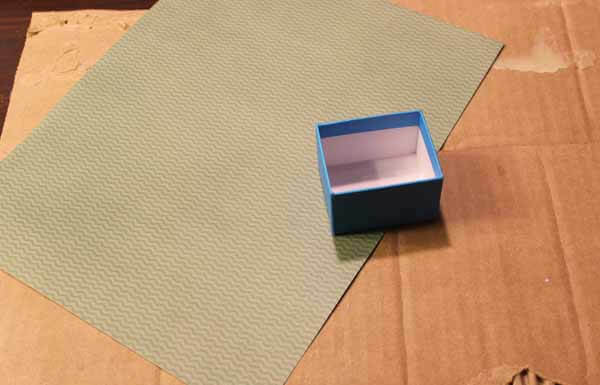 Take your piece of scrapbook paper and wrap it one direction around the box to find out how much you need to cover the box. Remember to leave some extra on each end so it can be folded to the inside of the box. Mark where you want to cut. Do the same for the other direction around your box. 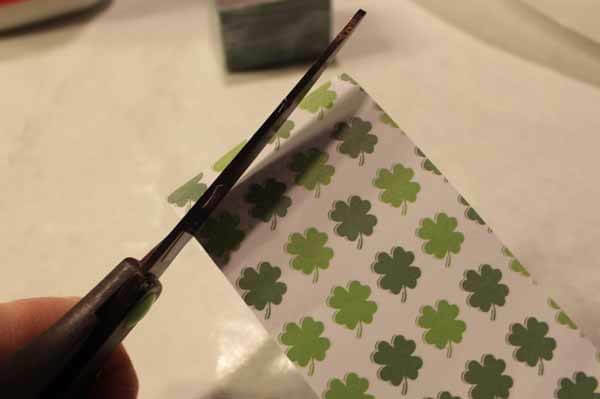 Use your ruler and pencil to mark a cutting line. Carefully use your ruler and Exacto knife to cut along your marked lines. Remember to cut on top of the cardboard so you will not damage your table! 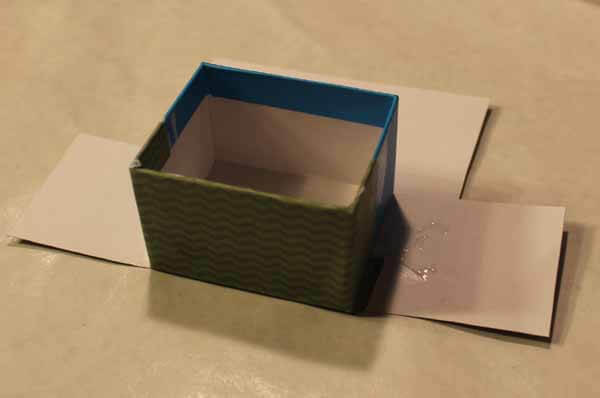 Put your box in the center of the paper (back side) and fold the paper up around the box. 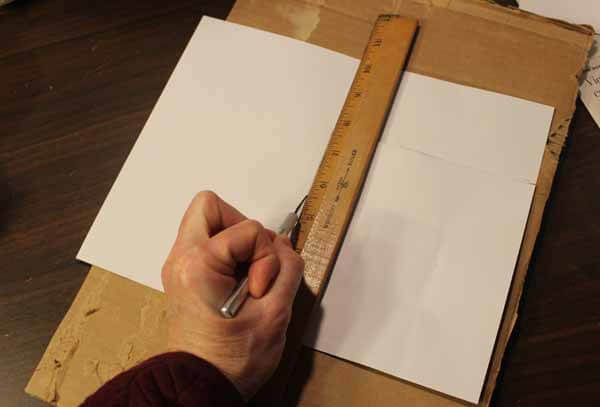 Make creases to show where the box should be placed and make sure your paper will cover the box. 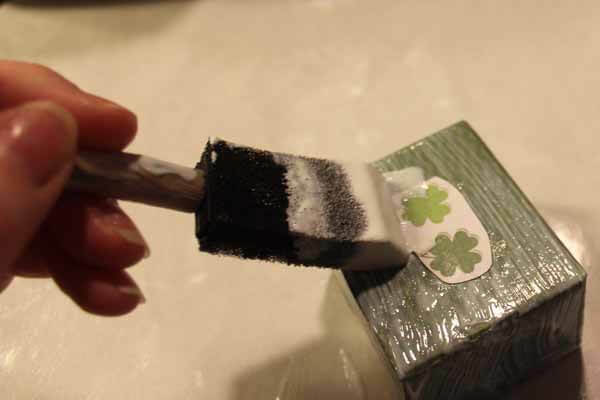 Using your paint brush or foam brush, apply some Mod Podge to the bottom of the box. 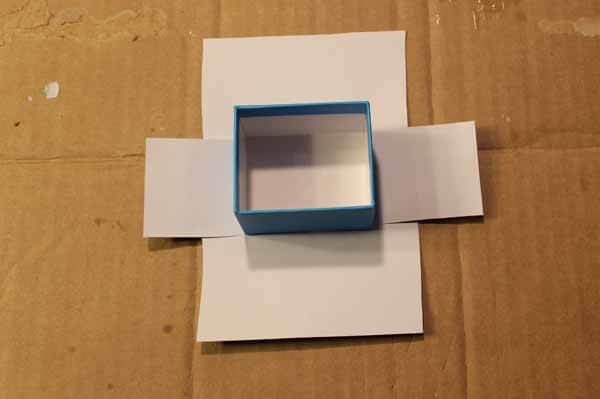 Place the box along the creases so it's centered on the paper. We will be folding up the paper around the box and currently there is a lot of paper on the corners. So, we will remove some of the extra paper. First, using your Exacto knife, cut slits from the box corner to the edge of the paper on the short sides (remember to use your cardboard). We will fold these sides up last and we want those to be even with the edges of the box. Next on the longer sides, cut the corner out so it appears as above. You will want the paper to wrap around the short sides of the box but not overlap with each other. Removing some of the paper will avoid the overlap and bulk. Place some freezer paper with the shiny side up on your work surface. You do not want the Mod Podge to get onto your table and you do not want the box to stick to the table or another surface. Start with a long side of the box and apply Mod Podge on that side and on the short sides where the paper will wrap around. Fold the first side up. The paper should extend above the top of the box as shown above. 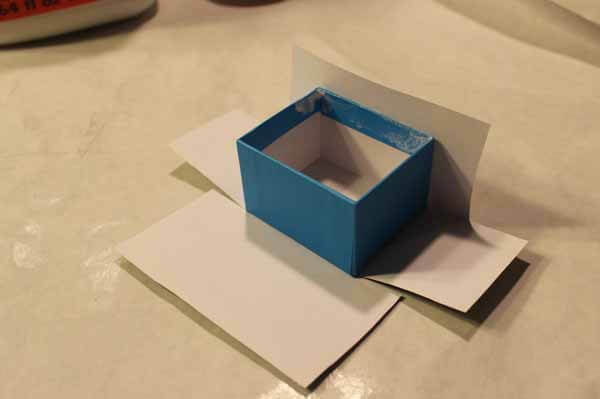 You can use a card or squeegee to smooth out the paper onto the box. 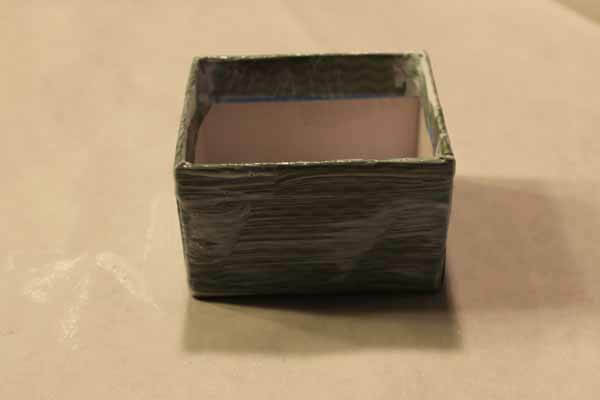 If your box is large, you may also want to use a brayer to make sure it's all smooth. Wrap the paper around the sides of the box. Make sure it all sticks down well. Add more Mod Podge as needed. 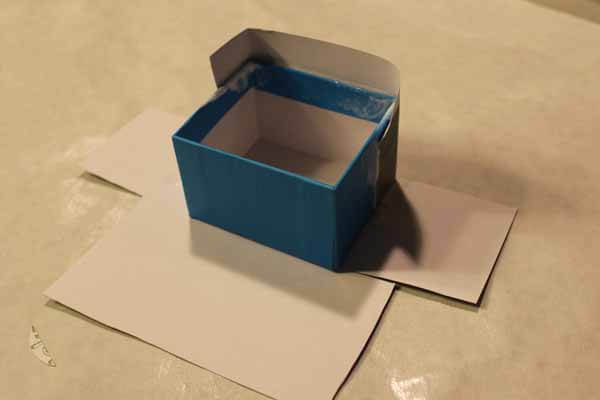 Flip the top edge of the paper to the inside of the box. 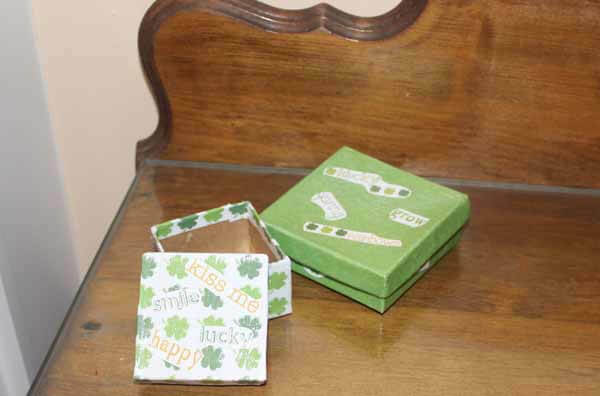 Apply Mod Podge to the top inside of the box and stick the paper down as shown in the above photo. Continue with the same steps as above to cover the other long side of the box. Your box should now look like the above photo. 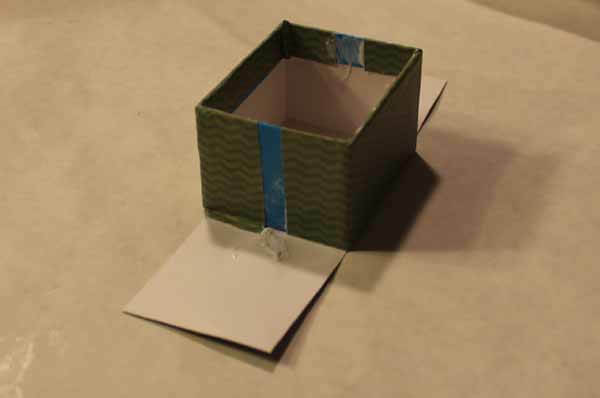 Apply Mod Podge to the short side of the box and fold the paper up to cover the side of the box and the previously folded over paper. 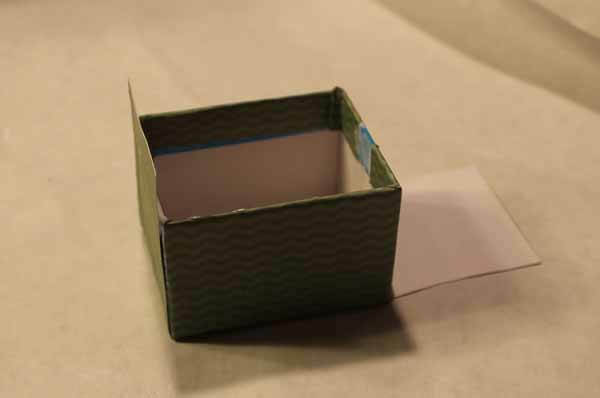 Flip the top edge down inside the box the same as before and use Mod Podge to glue it down. Finish the same way with the last side of the box. 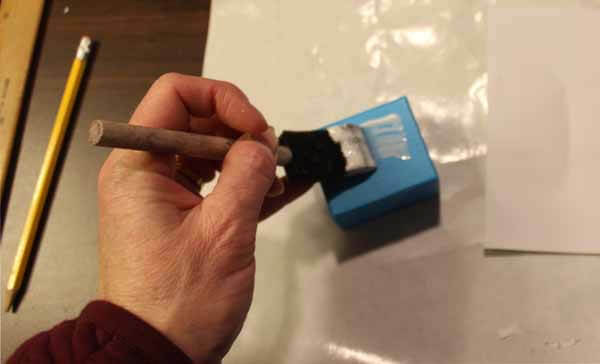 Use your paint brush or foam brush and paint the Mod Podge over the entire box. You can apply it to the inside of the box also. The Mod Podge will need to be applied in stages because we do not want it to stick to the table. 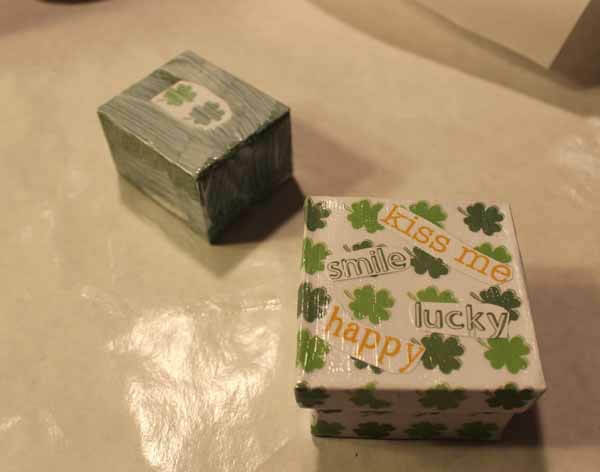 I started by applying the mod podge to the sides and bottom of the box turning the box upside down. I let the whole box dry. 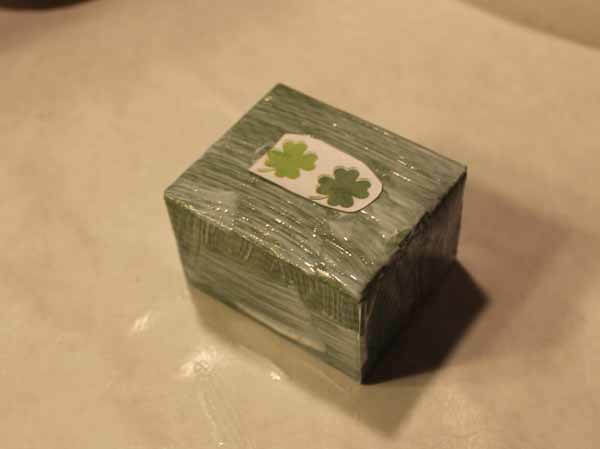 Then I turned it right side up and applied the Mod podge to the top edge and inside of the box. The Mod Podge will dry clear. You can apply multiple coats of Mod Podge as you feel is necessary. Two coats is probably good for this project. Other projects may need more coats. 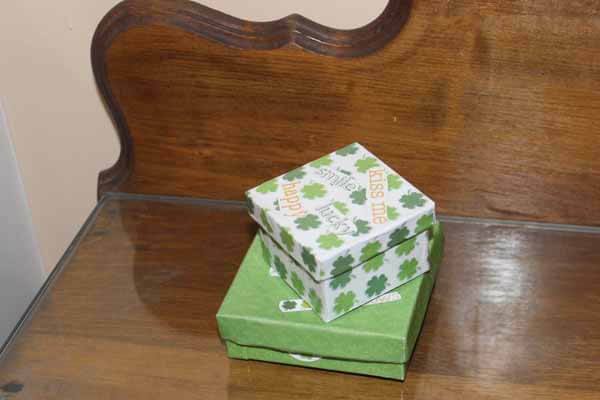 If your boxes have tight fitting lids, do not put as much Mod Podge on the inside edges of the box lid and along the top of the box edge. I found my box lids hard to put on/off since I put multiple coats inside the lids. Using boxes with looser fitting lids would work better! If you want to apply other decoarations to your box, do this either before you apply your first coat of Mod Podge or after the first coat is applied. Using your scissor, cut out the decorations from scrapbook paper. Apply Mod Podge to the surface and then stick the decoration on top. Cover the decoration with Mod Podge. You can apply more than one coat and see how it dries clear. These are my finished boxes. I think they turned out really cute and will make great decorations for Saint Patrick's Day. These boxes would make great gift boxes also. They can be made with any theme and can be used as decorations around your house. Make them for Easter, Christmas or even patriotic theme! This tutorial will show How to Decoupage a Frame. 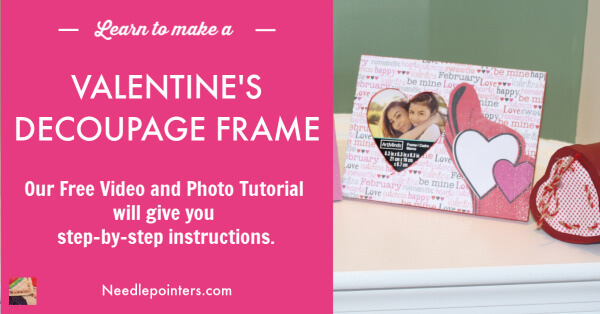 These are cute frames which are perfect for putting pictures of your loved ones. They make great gifts for Valentine's day or other holidays.